The nation’s unions responded to the twin disasters of the last two weeks – the enormous typhoon that struck the Philippines and the late-season tornadoes that devastated towns in the Midwest. Union members sent aid to both, and to the Philippines, nurses. The Fire Fighters coordinated disaster relief with their locals, and offered grants to any IAFF family that lost its home to any of the 81 tornadoes sighted in the Midwest. Local members from Missouri, Indiana, Iowa, Michigan and Ohio also responded to storm-related calls for help. The hardest-hit area was in the middle of Illinois, from Grundy County south of Chicago south to Champaign and southwest to the Peoria area. In Michigan, the Utility Workers reported their crews toiling for Consumers Energy there were working round the clock to restore power to 172,000 people. Utility crews from eight other states came to help out. The disaster that Typhoon Haiyan created in the Philippines: whole cities and villages are smashed, at least 10,000 people are dead, power is out – possibly for a year – and bodies must be hastily buried in mass graves to prevent epidemics. Food and water are short. 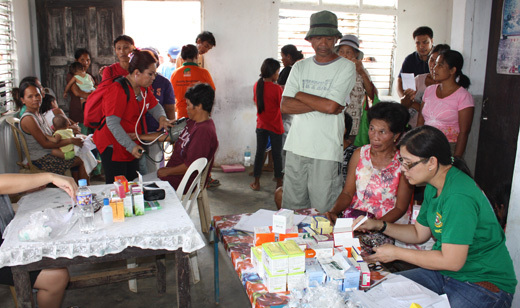 So is medical care, and National Nurses United dispatched teams of volunteer nurses to the hardest-hit areas to run makeshift clinics to tend to health needs of homeless Filipinos. The first team of 370 volunteer NNU nurses landed in the Philippines the Friday after Haiyan hit. Another 2,500 are planning to go, too. The typhoon destroyed several hospitals, along with homes, schools, power lines, bridges and virtually everything else, NNU Vice President Zenei Cortez later told a press conference upon returning to San Francisco after leading the first NNU group. “As U.S. nurses, we have seen the effects of deadly storms and disasters and the pain it causes for our families and communities. We know the difference it makes to provide support and assistance in an hour of need. We will do whatever we can to aid our sisters and brothers in the Philippines,” the union said. The Asian-Pacific American Labor Alliance, the AFL-CIO constituency group that includes Filipino-Americans, called the Nov. 9 typhoon one of the worst such storms ever to make a landfall. APALA asked for financial donations from members to fund “food, water, blankets, medicine and other relief materials” via private organizations. The aid is not going through the Philippine central government, which is overwhelmed, or local governments, whose officials may be viewed there as corrupt, inept or both, and whose facilities were also smashed. “Entire cities have been flattened, tens of thousands of people have been left homeless, children have been made orphans, the livelihoods of countless households have been destroyed. Streets clogged with debris and bodies have made it difficult for aid and relief services to reach many areas, especially those inhabited by indigenous communities,” APALA said. The Teachers immediately donated money for Philippine relief and opened its disaster relief fund to U.S. relatives of Philippine victims to send further aid. “We have many Filipino members in Baltimore, Louisiana, New York, New Jersey California and throughout the U.S. who are desperately seeking information about family and friends. AFT set up a toll-free hotline and an emergency e-mail address to assist in any way we possibly can,” the union added.